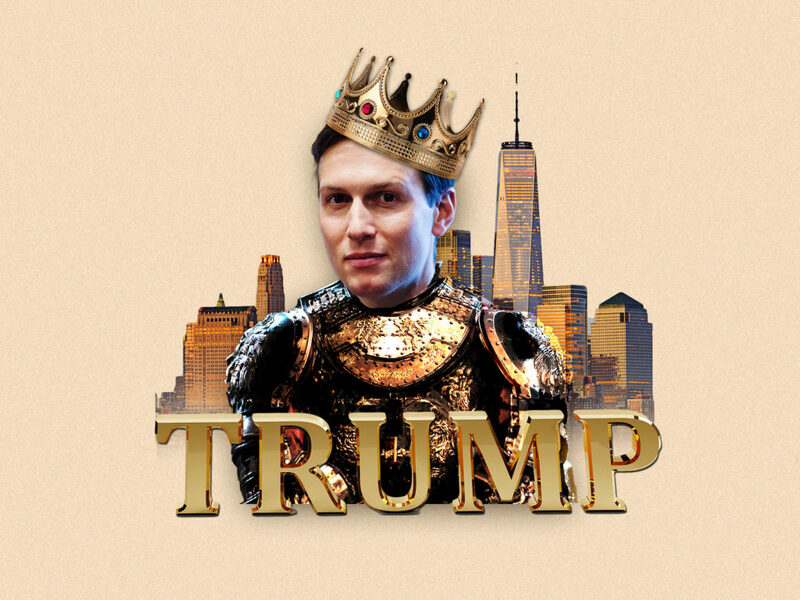 Even before entering Donald Trump’s life, Jared Kushner was an exemplar of unearned privilege empowering incompetence. Kushner’s father, Charles, was a New York real estate developer with no previous relationship to Harvard who nonetheless pledged the school $2.5 million after Jared resolved to go there. “There was no way,” says a former official at Jared’s high school, that anyone thought he’d get in on the merits. Yet he did. Under investigation for illegal political contributions, Charles blamed the inquiry on other family members. In response, he paid a prostitute to seduce his sister’s husband, had the result videotaped, and then sent his sister the tape. Unsurprisingly, Jared entered his father’s real estate business and proceeded to demonstrate his own distinctive ineptitude. In 2006 he paid a record $1.8 billion for an aging skyscraper at 666 Fifth Avenue, financing through debt at the peak of the housing bubble. As a result, the Kushner empire hemorrhaged cash, couldn’t cover the debt payments, and faced a $1.2 billion mortgage which was due this month. The dominant feature of Jared’s business career has been his desperate search for financing to bail out 666 Fifth Avenue. This real estate fiasco overshadows his tenure as the owner of the New York Observer. As described by his former editor, Kushner displayed a pervasive contempt for journalism and journalists; showed no interest in news or ideas; seldom read his own paper; and treated it as a vehicle for promoting the Kushner brand. According to Kyle Pope, Kushner killed stories regarding friends and pushed his editors to run a “hit job” against a lender adverse to renegotiating debt on 666 Fifth Avenue. The Observer foundered under his management and eventually ceased publication. All this, it seems, qualified the callow scion for a key role in the campaign of America’s premier nepotist. In June of 2016, Kushner joined Don Jr. and Paul Manafort for a meeting in Trump Tower with Kremlin-connected Russians who promised dirt on Hillary Clinton. Robert Mueller is probing the legality of this meeting and, therefore, Kushner. A related inquiry concerns Kushner’s management of the Trump campaign’s digital operation, which used personal data mined by Cambridge Analytica to micro-target voters in critical districts and demographics. One question is whether the Trump campaign and/or Cambridge shared information which enabled Russians to also target voters with their own fusillade of fake news. After the election, Kushner was given a portfolio which made this ethically suspect governmental and diplomatic ignoramus, among other things, the administration’s chief Middle East negotiator, the leader of the president’s initiative on government innovation, and a meddlesome West Wing adviser accountable to no one save Trump. These posts for a man whose sole geopolitical credential was the failed attempt to get funding for a building in Manhattan and whose only experience with innovation was failing to bring a once-respected newspaper into the digital age. For Kushner, like Trump, governance is personal, his charter without limits. He opposed the hiring of Chris Christie for various administration jobs, then drummed Christie out of the transition team. His reason was simple: Christie was the U.S. attorney who had prosecuted his father. In the same ungovernable spirit, Kushner continued his dubious—and often surreptitious—relationship with Russia. He met with then-Russian ambassador Sergey Kislyak to discuss setting up a secret back channel between Trump’s transition team and Russia. He falsified his government disclosure form to omit various contacts with Russians. When James Comey began probing Kislyak’s contacts with Michael Flynn, Kushner urged Trump to fire him. Concurrently, Kushner’s search for bailout money for 666 Fifth Avenue included meetings with a conglomerate closely tied to the Chinese government. Similarly, the Kushners approached Saudis and Qataris—which is, at the very least, inappropriate for a man charged with America’s Middle East portfolio. This was not the first time Kushner had appeared to commingle his foreign policy brief with his personal business interests Shortly after the election Kushner met in secret with the head of a Kremlin-connected Moscow bank under sanctions by the United States. While Kushner later claimed that the meeting concerned diplomacy, the Russian said the subject was business—which, given the sanctions, would have been illegal. Kushner’s sister mentioned her brother and Trump while seeking $150 million from Chinese sources to finance a New Jersey housing development. Kushner held White House meetings with Apollo Global Management and Citigroup—allegedly to discuss public policy—whereupon both entities made large loans to the Kushners. To say the least, one cannot view the totality of these behaviors without worrying that Kushner is using the White House and American foreign policy to leverage his private business interests. Yet that would be the least of the problems created by his unsupervised and unmediated exercise of power. For the harshest truth is this: Kushner poses a grave national security problems for America. The Washington Post reports that “officials in at least four countries have privately discussed ways they can manipulate” Kushner by “taking advantage of his complex business relationships, financial difficulties and lack of foreign policy experience.” After these concerns drove career intelligence officials to deny him a top-secret security clearance Trump intervened to overrule them, then lied about it, furthering the prospect of Kushner’s exploitation of his position and susceptibility to foreign interests. One example: In 2017, Charles Kushner sought financing from Qatar’s minister of finance to bailout 666 Fifth Avenue. When the deal sputtered, Jared reportedly supported Saudi Arabia’s blockade of Qatar, in contradiction of the recommendation of the U.S. secretary of state. We don’t know what role Kushner’s business interests may have played in his pan-Arabic maneuvering. But last August—after America prevailed on Saudi Arabia to drop its blockade of Qatar—Charles Kushner tapped a fund largely controlled by the Qatari government to refinance the mortgage then due on 666 Fifth Avenue. Which brings us to Kushner’s relationship with Saudi Crown Prince Mohammed bin Salman. After Trump’s election, Saudi officials targeted Kushner for cultivation; soon American officials began worrying about the numerous private meetings and conversations between MBS and Kushner. Persuaded that MBS was essential to America’s Middle East policy, Kushner pushed Trump to make his first state trip a visit to Saudi Arabia—while exploring whether America could help make MBS, not yet the crown prince, heir to the Saudi throne. Imagine if this sort of thing had happened under George W. Bush, Barack Obama—or any other American president of either party. But now it has. To a remarkable degree, Jared Kushner encapsulates the myriad malignancies of the Trump administration in a single human being. He has no experience, or knowledge, or skills relevant to his position in government. He displays no awareness whatsoever of ethical or moral boundaries. He floats on a cloud of grandiosity unrelated to the complexities of governance or diplomacy. He is despised not only by the left, but by the president’s own base. He would never have achieved this dangerous accretion of power had he not married Donald Trump’s daughter. Trump’s White House is a family business run amok. The normal rules of competence, probity, and performance don’t apply to Jared or Ivanka. Any president save Trump would feel compelled to fire an official as conflicted and compromised as Kushner. Instead, Kushner drives away any official who displays a modicum of independence, or who seeks to constrain his influence. And so, the most potentially toxic result of Kushner’s unconstrained freelancing—his empowerment of the mercurial and unstable MBS. To be kind, his enthrallment is ill-judged. Once empowered, MBS locked up rivals; terrorized dissenters; repressed women; blockaded Qatar; effectively kidnapped the Lebanese prime minister; perpetuated Saudi war crimes in Yemen; killed or seized Saudi dissidents abroad; and—according to the American CIA—authorized the murder of Jamaal Khashoggi. Some of these horrors may bear Kushner’s fingerprints. MBS reportedly bragged that Kushner gave him classified information that enabled him to target his enemies. After the brutal butchery of Khashoggi, Kushner reportedly became his most zealous defender within the White House, counseling MBS on how to remain in power. Even for normally compliant Republican senators, dismembering a dissident journalist and legal resident of America proved too much—an overwhelming majority passed a resolution repudiating MBS. Yet there is considerable speculation that Kushner’s latest private meeting with MBS involved America potentially selling Saudi Arabia nuclear reactors which could be used to make nuclear weapons—a reckless gift to a brutal authoritarian in an already volatile region. America may be forced to live with MBS. But, from Kushner, enough. Law—in the person of Mueller—will address the question of Kushner’s criminality. But the comprehensive scrutiny of Congress of his conduct in office could accomplish a more immediate good: separating this intellectual and moral cipher from America’s governance. Richard North Patterson is a lawyer, political commentator and best-selling novelist. He is a former chairman of Common Cause, a member of the Council on Foreign Relations, and serves on the board of the Renew Democracy Initiative, a bipartisan group dedicated to defending the principles of liberal democracy at home and abroad.